Here come the girls! It was great to see a number of our ladies playing alongside the gents this Sunday in The Great War Commemorative Competition. All observed the two minutes silence at 11:00am out on the course and then all changed to jacket and tie out of respect for our fallen soldiers. There were some fantastic scores in with Richard Jenner coming in runners up spot with 41points, but way out in front and showing all the chaps how it's done with a superb 45 points was Geraldine Scanlon. A great round helping that 10 shot handicap reduction this year, keep up the great golf Geraldine. This winter I will be running monthly Nearest the Pin Challenges in the warm on the GC2 golf simulator. I will kick off with the 'World Famous Postage Stamp', the 115 yard 8th hole at Royal Troon. This first challenge will run until Saturday, 31 December so come and have a go, it's just £2 for five goes, with some great prizes, but be warned this one's a tricky old pin… good luck! Secondly, I would like to offer you the '10 Yard Challenge', simply book in with your driver and if I can't get another 10 yards on your drive by either the latest technology or a little pointer here and there then I'll give you a FREE sleeve of golf balls. So many golfers are playing with a driver that quite often doesn't suit their swing and speed, either too stiff in the shaft, not enough loft or simply a club from the last century. So come on, what have you got to loose? I'll see you in the Swing Studio! Stag Supper - Friday, 18 November - Still one or two spaces left. Turkey Trot - Over the weekend of Saturday, 10 December and Sunday, 11 December, a great fun Texas Scramble team event with a big presentation on Sunday afternoon to a packed clubhouse. We only have four tee times on Saturady and two times on Sunday remaining, so hurry up and get you names down in the last few spots. If you don't have a team then let me know and I'm sure I can get you together with some other members in the same boat. 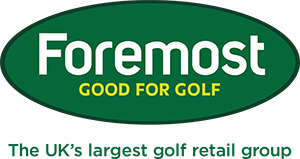 We have another big festive day the following week as I've put on 'The Pro Shop Christmas Pairs' on Sunday, 18 December. We will be having a buffet and bubbles at breakfast from 7:15am followed by pairs betterball, but with the added both scores to count on all par threes. The event is open to all seven day lady and gents and as it Christmas. If you would like to bring up a guest to play as your partner you are more than welcome! There will be prizes all around the course as well as a special prize for the best Christmas jumper. Cost - £25 per pair including breakfast. Head to the men's competition board to sign-up. On Sunday, 18 we are also hosting a Christmas Carvery Lunch, so whether you are playing in the morning and would like friends and family to come up and join you, or you would like to enjoy a lovely festive feast with friends, please book in as places are going fast. Click here to see our promotional poster for more details. New Year's Eve Celebration - Saturday, 31 December - Hurry as tables and spaces are filling fast. Monday, 21 November - All greens will be verti-drained; this will cause holes in the surfaces to help maintain the root structure of our green. Monday, 28 November - Friday, 2 December - Tee levelling on the 2nd, 10th, 14th and 16th holes will commence. The tees will be stripped, levelled and re-turfed ready for the new season. 8th green - the bank at the rear of the green is to be removed to help with drainage and to reduce scalping from the machinery. 13th green - to the right the green two of the small Hawthorne tree will be removed to help improve the right-hand side of the putting surface. These areas will become ground under repair so please take full relief. Please be aware of the green staff working in these areas and apologies in advance for any inconvenience caused. Extensive range of Under Armour and Puma winter wear – from £35 . If you head into the pro shop we have just put up this year Christmas Draw offering you a chance to win a fantastic custom fit experience at the Callaway Performance Centre, to fit you for the latest set of irons. 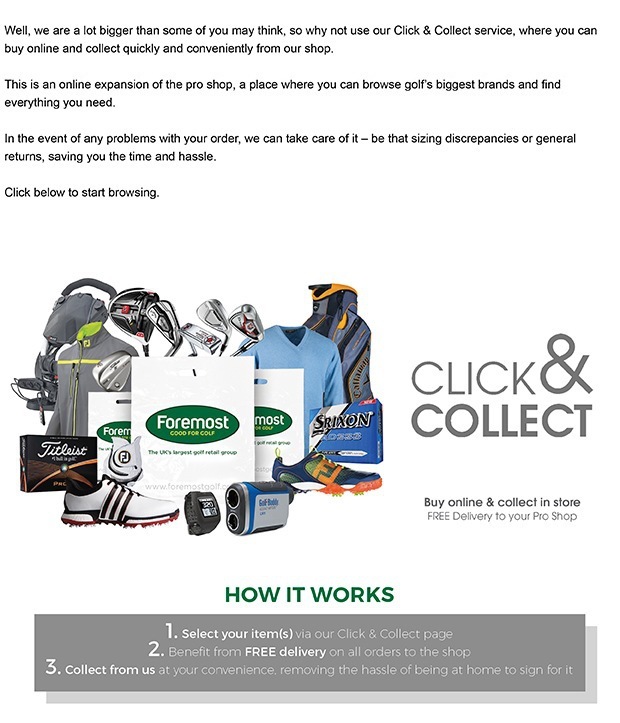 Until the 20th November 2016, we are running a fantastic offer with our friends at Motocaddy. 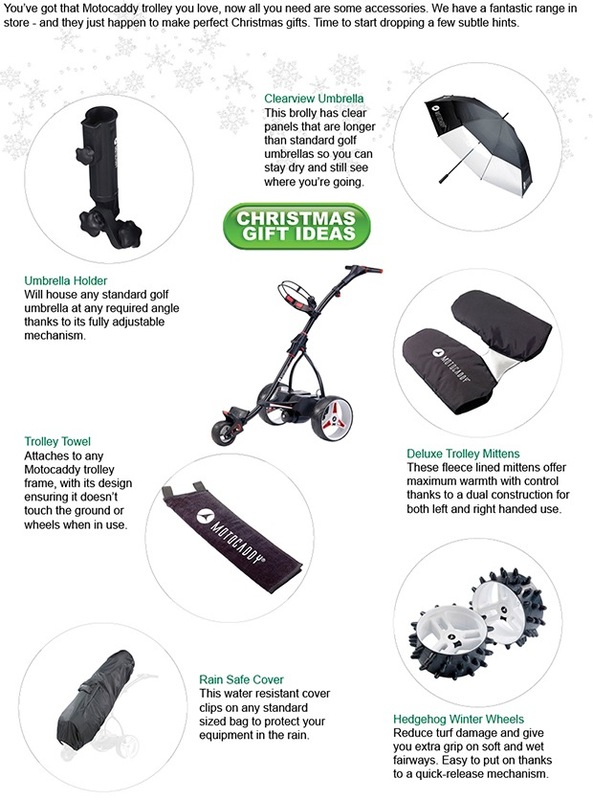 When you purchase an electric trolley – selected models only, including the recently launched S1 DHC trolley – you will get a Motocaddy cart bag at half price. Time to treat yourself? Whether you’re running low on balls or need a present for that golfing-mad relative, our FREE Srixon Ball Personalisation is the perfect answer. With seven options for you to choose from – including the AD333 Tour and Soft Feel Lady – there is a ball for everyone in Srixon’s line-up. Can't find what you're looking for in store? Is your Motocaddy missing something?